Here's my super simple card for the current sketch at Freshly Made Sketches. I used a trio of triangles from Altenew's Sohcahtoa stamp set for the cluster of elements in opposite diagonal corners of a white cardstock panel. To add interest, I stamped each triangle in a different color pigment ink and accented each shape with a small enamel dot. The set's "happy birthday" sentiment was stamped in the center of the panel in mint ink. It doesn't show well in the photo, but I promise it's there! The soft colors look so pretty IRL. I adhered the finished panel to a coordinating and easy to write on mint card base. 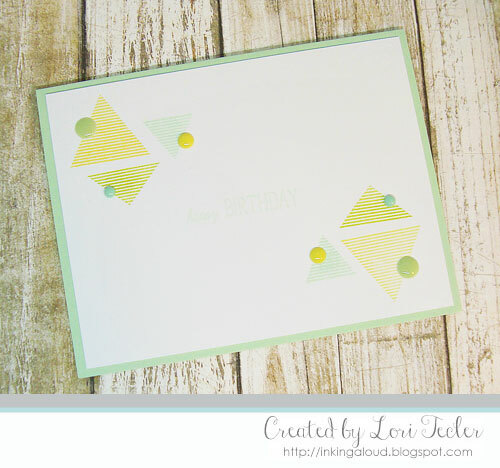 I love the soft colors and fun geometric shapes on this pretty card! Thanks for joining us at Freshly Made Sketches this week! I love the graphic triangles in these soft colors. Really pretty. So glad to see you this week at FMS!